All four of our special needs children struggle with emotions in different ways. 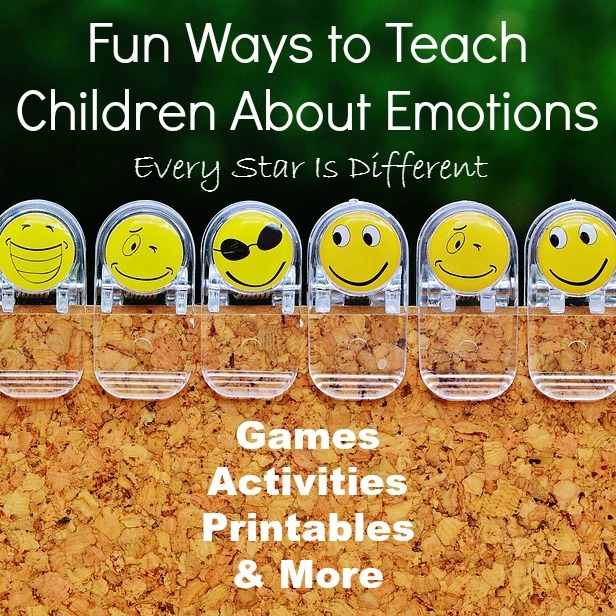 We're constantly working on identifying, expressing, and responding to emotions appropriately. Today Princess was working on expressing feelings related to an incident that occured earlier in the week. She had several questions about emotions. Her questions inspired these 5 lessons to teach kids about balancing emotions. The very beginning of Princess' life was filled with trauma. Her needs were not met and she was hurt in many ways. Princess survived this difficult period in her life by developing coping mechanisms. She ignored her needs and turned off her emotions. If she was smiling and well behaved, she would remain safe. When she expressed her needs and emotions, she was punished. We had hoped that once Princess was in a stable and safe environment she would begin to trust and make progress with her feelings. However that wasn't the case. Instead, because of the continuous trauma she experienced, the make up and chemistry of her brain has changed. Therapy over the past year has been focused on helping Princess learn to identify emotions and express them. As she has begun this difficult process, she is overwhelmed with negative emotions. These lead to extreme behaviors and ultimately a desire to resort back to her original unhealthy way of coping. 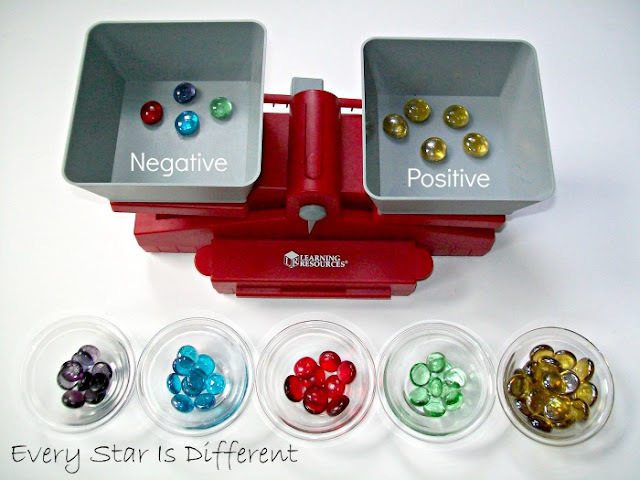 Today, I pulled out our Learning Resources Precision School Balance and explained that one side of the scale was negative emotions we feel. The other side was positive emotions. I gathered glass beads in five different colors: purple, blue, red, green and yellow. Each color was selected purposely to represent different emotions. For today's purposes, we focused on the emotions and colors used in Disney's Inside Out. These emotions are very similar to the five basic emotions taught during Princess' therapy sessions. 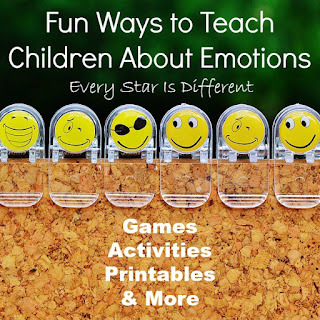 The activity can easily be adapted to represent those emotions, if preferred. 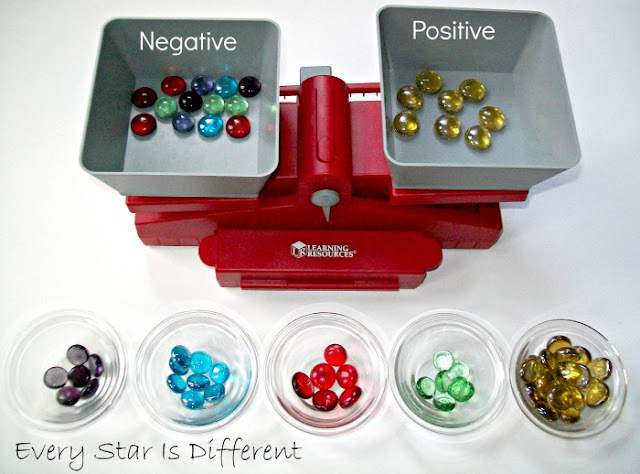 I added four negative emotions to our scale, one for each feeling. I then commented that the scale was unbalanced and asked Princess what we could do about it. Her first impulse was to remove the negative emotions. I told her that removing negative emotions wasn't allowed. Once we've felt an emotion, we can't unfeel it. Lesson I: Feelings remain inside us. After pausing for a moment, she decided it best to add one positive emotion. I commented that the negative emotions still outweighed the positive. One positive emotion isn't enough to tip the scale. Then I asked her what she could do next. Lesson II: Several negative emotions easily outweight and over-power one positive emotion. Princess decided it best to add four more positive emotion beads. I commented on how many positive emotions she added to outweigh the negative ones. 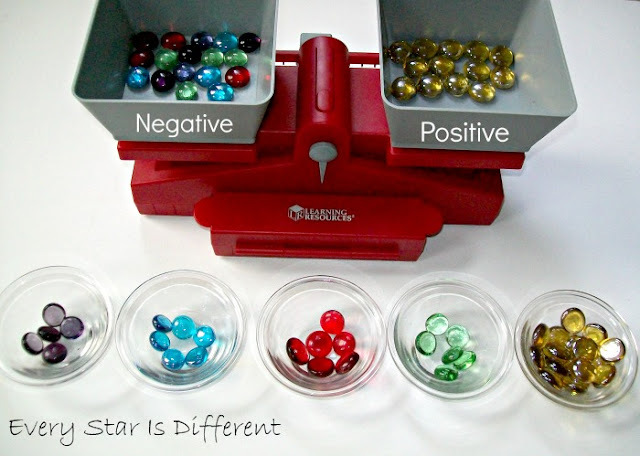 Princess was able to give specific examples of when each of these helped her in the past. Lesson III: Positive emotions can overcome the effects of negative emotions. Next, I added several more negative feelings, offsetting the balance once again. Without hesitation, Princess began adding positive emotions. As she did, I put in more negative emotions. The scale was off balance again. Lesson IV: Negative emotions will always be a part of life. I asked Princess how we could keep her emotions balanced when she is constantly feeling new positive and negative emotions. We discussed the importance of each type of emotion and how all of them together make up our experiences and who we are. 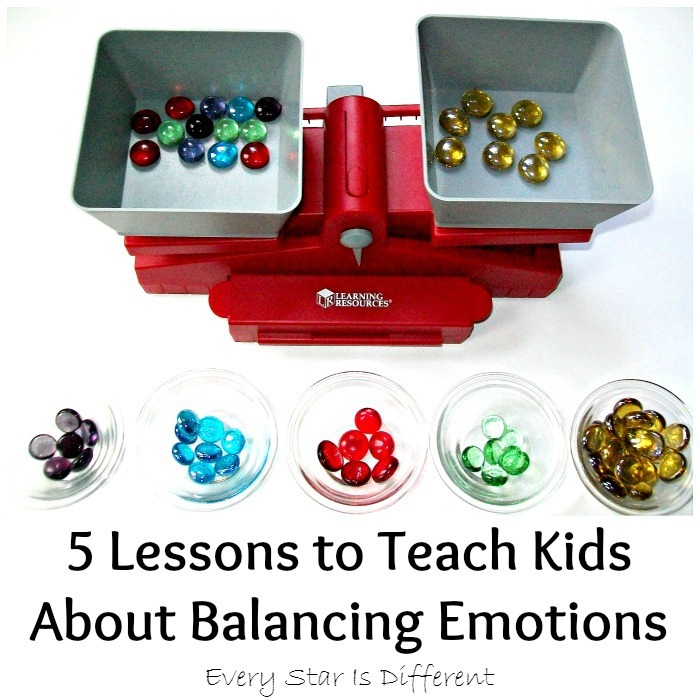 Lesson V: In order to achieve balance, we must value and accept all the emotions equally. Princess' journey of identifying, expressing, and accepting her emotions has and will continue to be very difficult. It's my hope, that with impromptu inspired lessons like today's, the importance of the process will start to make sense to her. I know that feeling emotions can be painful, but once she's able to feel them, she can find that balance. What a beautiful way to help explain the importance of balancing emotions in a very visual way. 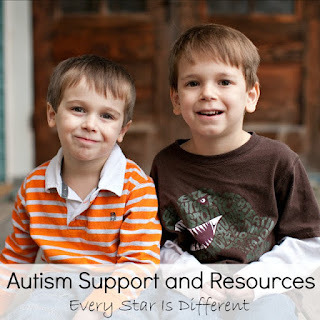 Wonderful post on helping Princess with her emotions. I love how you explained the need for balance. 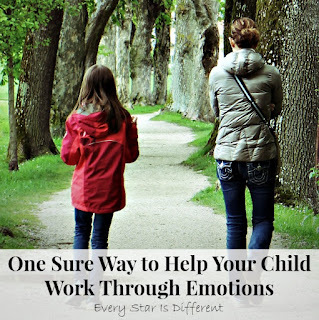 I love the idea but think that all emotions can be both good and bad. You can be angry to fight injustice or angry because you don'y get your own way. You can be joyful because you got what you wanted or joyful because you love life etc. I think it may be better to not have the names of the emotions categorised as good and bad but find examples of all emotions to be positive and negative. I hope you understand what I am trying to express here. I love the idea and will use it slightly changed. Thankyou. Thank you so much for your comment. I'm glad that you love the idea and am not offended one bit if you modify it. This exercise was specific to how our daughter Princess was feeling at the time. 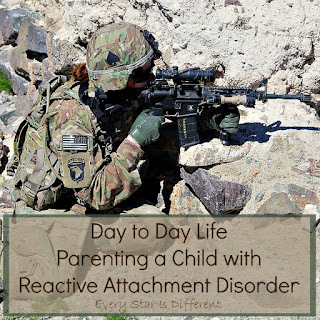 Her trauma background, Reactive Attachment Disorder, PTSD, and therapy work are all factors in how we presented the activity to her, to best meet her needs and her cognitive abilities in the moment. I agree with you 100% that all emotions can be both good and bad. She's just not at the point of understanding that yet.